Today the mention of the Kenya boxing team does not capture the imagination of anyone. Whenever the Kenyan boxing team participates in any tournament, be it the All African games or the commonwealth games, one can expect perhaps a bronze medal or two if Kenya is lucky. There was a time however when the mention of the Kenya boxing team would send shivers down the spines of other countries and sheer raptures to Kenyan boxing fans and in fact Kenyans in general. The Kenyan boxing team, aka the hit squad was a source of pride. No moment captured this glorious era more than the 4th All African games of 1987. Keep in mind that in those days, the All Africa games was a premier event to which the entire continent of Africa paid attention. And when Kenya hosted this event in 1987, the entire country was engrossed. Kenya sent 8 boxers into the boxing finals held at the Kenyatta international conference centre. That day the hit squad put on an exhilarating performance of power punching, quick feet, stylish moves and accurate punching that overwhelmed all the opponents. All 8 memebers of the hits squad. won their matches thus netting 8 gold medals as the partisan local crowd went into a near delirium. Even cabinet minister, Robert Ouko, who was in attendance could not hold back his exhilaration as he leaped up and down the dais each time a Kenyan won. Superheavyweight Chris Odera who beat Tschibalala Kadima of Zaire. A year later at the 1988 Olympics in Seoul, Robert Wangila made history by becoming the first African ever to win an Olympic gold medal in boxing when knocked out Laurent Bouduani of France in the final. The Knockout was significant because boxing results in those days were determined by the judges. And these judges were blatantly biased against African boxers. As such it was a well known fact that for an African to win, he either had to thoroughly dominate the fight of win by knockout. At those same Olympics, middlweight Christopher Ochieng Sande won a bronze medal. Kenya were commonwealth games boxing champions in 1982, 1990 and 1994. In 1990, gold medals at the commonwealth games came via light heavyweight Joseph Akhasamba and heavyweight George “Foreman” Onyango. During the light welterwight final, Kenya’s Nick Odore so thoroughly and utterly dominated the final fight against Charles Kane of Scotland that the match commentator who was British, proclaimed, “This is obviously a win for Kenya”. Imagine the shock on Kenyan TV viewers when the blatantly biased judges awarded the match to Kane. Such was the atrocious officiating at international boxing matches in the pre-computer era. The other silver medal came via Abdirahman Ramadhani. Kenya’s performance at the 1994 All Africa games was even better. Abdirahman Ramadhani improved to gold in the light flyweight. Omar “Kassongo” Ahmed won gold in the heavyweight berth, while silver medals came via superheavyweight David Miriambo Anyim and Duncan Karanja. Middlweight Peter Wanyoike and light heavyweight Odhiambo Opiyo won bronze medals. Boxing standards have dropped progressively since the 1982 games in Brisbane where Kenya clinched three gold medals, a silver and a bronze to retain the overall boxing crown they had won in the previous games in Edmonton, Canada. The gold medallists in Brisbane were light-flyweight Ibrahim “Surf” Bilali, flyweight Michael “Spinks” Mutua and Hussein “Juba” Khalili. Light-welterweight Charles Owiso got silver while heavyweight Mohammed Abdalla Kent settled for bronze. The supremely talented Bilali went on to win a bronze medal at the 1984 Olympic games. Kenya had lifted their maiden title four years earlier in Edmonton with seven medals through gold medallists light-flyweight Steve Muchoki and his younger brother, flyweight Michael “Stone” Irungu. Lightweight Patrick “Mont” Waweru, who later became national team coach, won a silver medal, as did light-middleweight Abdurahman Athuman. The bronze medallists were bantamweight Douglas Maina, light-welterweight Michael Mwangi and light-heavyweight Edward Thande. 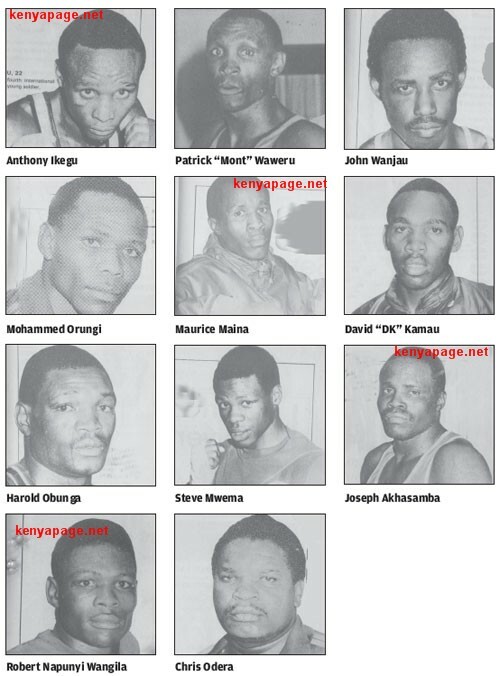 How does one explain the superlative performance of Kenyan boxers in those days ? To begin with, there were boxing in neighbourhoods all over Nairobi that nurtured the talents of urban youth who showed an aptitude for boxing. Most notable of these was the Dallas boxing club in Nairobi’s Muthurwa estate which produced dozens of future world beaters. There was also Nakuru boxing club which also produced several excellent boxers like Olympic bronze medalists like Philip Waruinge. Waruinge represented his native country at three consecutive Summer Olympics, starting in 1964. After having won the bronze medal in the 1968 Olympics in Mexico, Waruinge captured silver four years later at the 1972 Olympics in Muninch, West Germany. He was awarded the Val Barker trophy for Outstanding Boxer at the 1968 Games. Stephen Muchoki was Kenya’s next great boxer, winning gold in the light flyweight at the 1974 Commonwealth games. A second reason for the high boxing standards in Kenya was the highly competitive national league, played on home-and-away basis. Talented boxers were offered jobs by companies like Kenya Breweries, Police Armed Forces, Prisons, Kimbo, Posta and Railways. Having an excellent boxing was matter of pride for these companies. Officiating was done by an independent body, the Referees and Judges Association of Kenya (R&J) which was affiliated to the Amateur Boxing Association of Kenya and its officials were neutral. However the R&J fell out of favour with ABA during the 1983 annual general meeting. ABA then formed a commission within itself to take over R&J duties. That was the beginning of the dwindling standards of the local sport. Coaches formed the bulk of the commissioners and they soon started cutting deals. Nowadays, one can easily pick a winner in a boxing contest by merely checking who the ring officials will be. The ABA Nairobi branch was once the backbone of boxing in the country but all that changed with the demise of clubs like Kenya Breweries, Post, Kenya Railways and Kimbo. All the medallists in the Brisbane 1982 Commonwealth games save for Mutua of Kenya Railways – came from the Breweries club. It was Breweries boxer Robert “Napunyi” Wangila who, in 1988, won Kenya her first and only Olympic gold medal, in Seoul. To put it in perspective, Kenya has not won an Olympic medal since 1988. And at the Commonwealth games which Kenya used to dominate, Kenya has won two bronze medals at the last two games in 2006 and 2010. This entry was posted in kenya boxing, Kenya's greatest sports teams, kenyan boxers and tagged Anthony Ikegu, chris Odera, david dk kamau, harold obunga, John wanjau, joseph akhasamba, kenya boxers, Kenya Boxing, maurice maina, mohamed orungi, Patrick Mont waweru, robert wangila, steve mwema. Bookmark the permalink. The change of boxing format to tournament from the former home and away format of team “a” versus team “b”,have killed the game totaly.boxing used to be much fun to watch then because of good talents which were observed. kenyan boxing has gone down and will continue to go down if nothing will be done. Corruption is the order of the day with promoters in pro boxing paying boxers as little as 2000 ksh fo a professional bout. Where is the national spirit? i big up on champion ms Bena Kaloki fo the good work she is doing with Bena Promotions keep up the good work others should follow in the way of this champion. We have potential Mayweathers in kenya, we have Wangila’s but corruption, fraud and embezzlement if bixers fund is killing the sport. Am speaking with pain because my dad quit boxing because of this his brother has stayed due to the love of the sport but he is frustrated so are other boxers. WE NEED OUR BEATIFUL SPORT BACK! I will do something to revive the boxing spirit in this country. This was my sport and I still like it. I miss Harish, Surf, Demosh, Odore, Dancun Karanja “Oranjo”, Good lord those were the days. Am a potential boxer but i’ve resulted to driving coz the sport is not paying.something to be done. Great page! Question for any historians of Kenyan boxing history – in 1980, with the boycott of the 1980 Moscow Olympics, did Kenyan boxers participate (or even host) any “alternative” Olympic boxing events? Too bad the ‘hit squad’ is not well recognised, they should be paid handsomely for bring such glory to Kenya,most of them are living a poor lifestyle! Beacause there were entrance fees charges at 50ksh in the 2012 intermediate competition finals of which the “Pal Pal gym” flocked to the fullest. how do you exepect me to treat my dislocated arm when i have walked out of the ring with a penny less victory “aki ya mungu” nkt!!? Man we have to make a demonstration coz am not ready to loose hope. I look at his medals and they’re reminders of a dad who made kenya proud at the time. R.I.P dad. Which boxer was your father ? Edward Thande. He passed on 4th april 2014. There is one boxer “per excellence” you did injustice to by forgetting to mention. Everybody expected him to be the best winner of any major boxing event, and more often than not, he was. He and Modest Napunyi, a contemporary and another outstanding boxer, would later leave for Japan to start a professional career. His name was Isaiah Ikhoni. Thank you very much Gachanja, to remember great boxers like Modest Napunyi. My name, Lawrence Kihura (Kiora). I am working now on a strategy that will get it back these will take some time grant me your patience and once its up kindly support, we will need your numbers and generous contribution to make these happen. The strategy is to prepare Kenya for both armature and professional boxing on its feet. “I salute the fallen heroes who made these country proud and tell there families that soon there prayers will be had we will have more than enough and every tournament will remember them forever. Be ready for the Big thing coming!!! !